Ingredients: Phyllanthus niruri extract, choline bitartrate, milk thistle extract, cellulose mycrocristaline, talcum, magnesium stearate. The liver is a vital organ of the human body. The liver meets the daily over 500 biochemical functions of nutrients from food processing to the neutralization and elimination of toxic substances from the body. 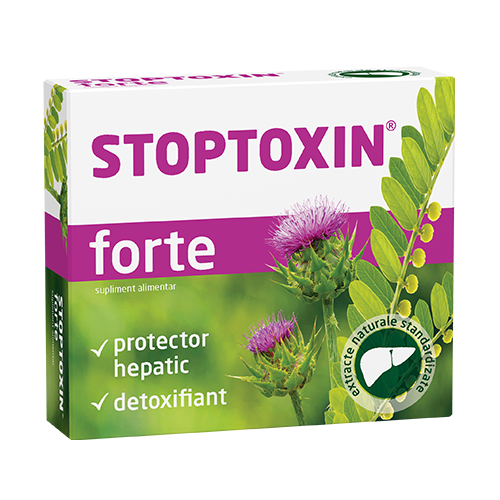 Stoptoxin forte, capsules is recommended in the protection of hepatocytes against the deleterious effect of toxicants (food additives, drugs, alcohol, cigarette smoke), as well as for the normal functioning of the liver. 1 capsule x 2-3 times/ daily for at least 4 weeks. It is not recommended for persons with hypersensitivity for any ingredient. Store below 25°C in the original package. Box with 3 blisters of 10 capsules and leaflet.